MAGNUS and CLEO are forced to test the strength of their love when Gaius returns to Mytica claiming he's no longer the King of Blood but a changed man seeking redemption. LUCIA, pregnant with the child of a Watcher, has escaped the clutches of the unhinged fire god. Her powers are dwindling as she goes forth to fulfill a prophecy that will keep her baby safe...but could mean her demise. JONAS treks back to Mytica with a plan to overtake Amara, but fate takes hold when he runs into the beautiful Princess Lucia and joins her on her perilous journey. 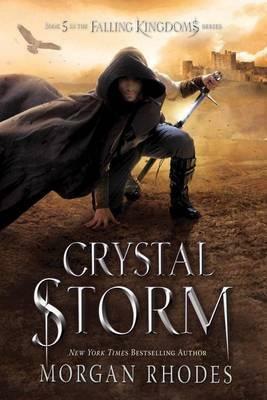 AMARA has taken the Mytican throne, but with no way to unleash the water magic trapped within her stolen crystal, she'll never be able to seize glory and get sweet revenge. Morgan Rhodes is the New York Times bestselling author of the Falling Kingdoms series. Under another pen name, she's an award-winning author of more than two dozen novels. Morgan lives in Southern Ontario. Connect with her on Twitter @MorganRhodesYA or visit fallingkingdoms.com for more info.